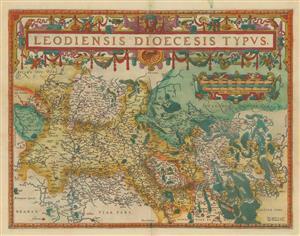 Splendid Dutch Golden Age map of the Diocese of Liège. Latin descriptive text on verso. Original hand-colour. "It is a region exceedingly pleasant and fertile of all things, especially in the Northern part, where it joins Brabant. For there, it abounds with corn and all kinds of fruits, and in some places it yields wine. But on its Southern frontiers towards Luxemburg and France, it is somewhat more barren, mountainous and covered with woods."